Improvements in engine design and reduction gearing followed their separate paths. 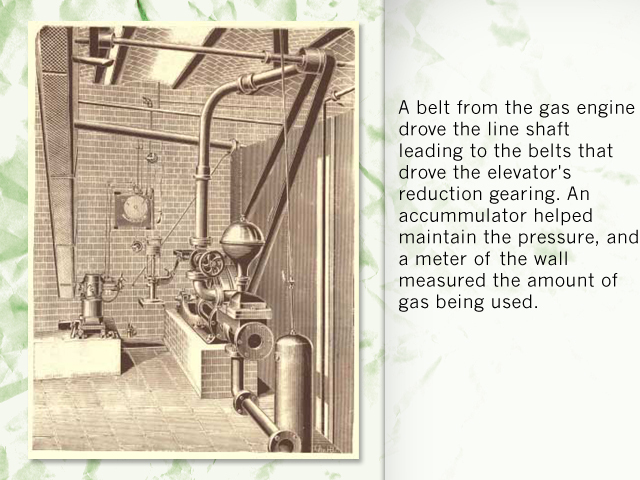 The power engineers were concerned with developing an increasing amount of pressure whether in a central plant or on-site; this involved increasing the strokes of the steam, and later the internal combustion engines. 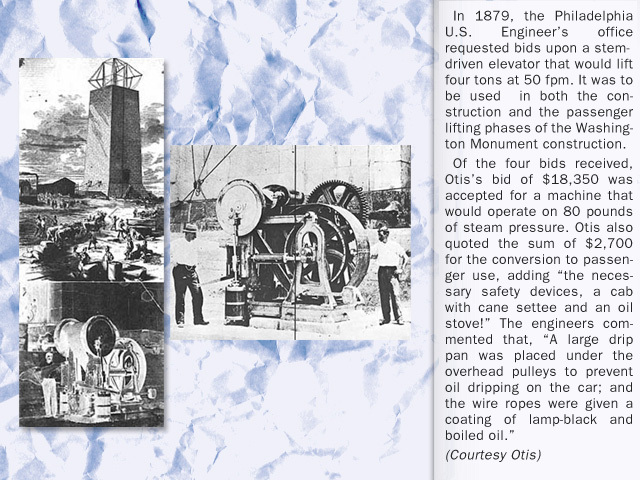 In the instance of the central steam plant, they were primarily interested in taking the power to the customer, much as the electric power company does in our day. We have the option of placing a wide variety of appliances on our power line. 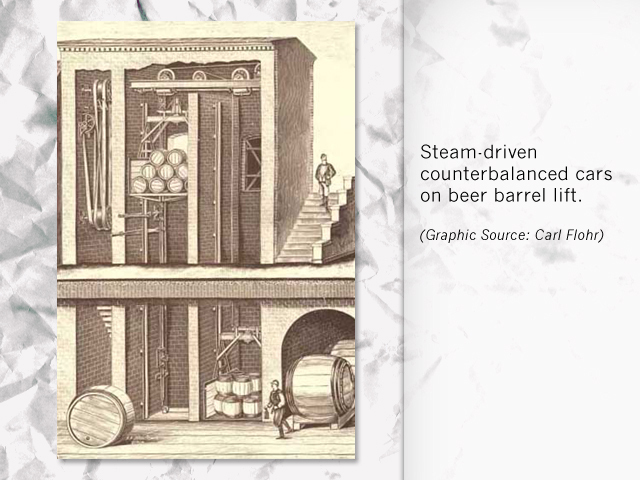 So it was in the Industrial Revolution, users were on the other side of the equation, developing mechanisms that would use the steam for their particular purposes -- particularly driving various kinds of mill and other factory production equipment. 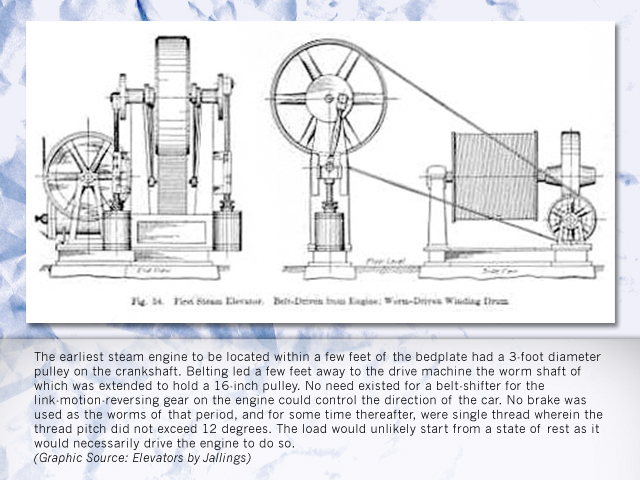 Other engineers developed the reduction gearing that would harness the steam. 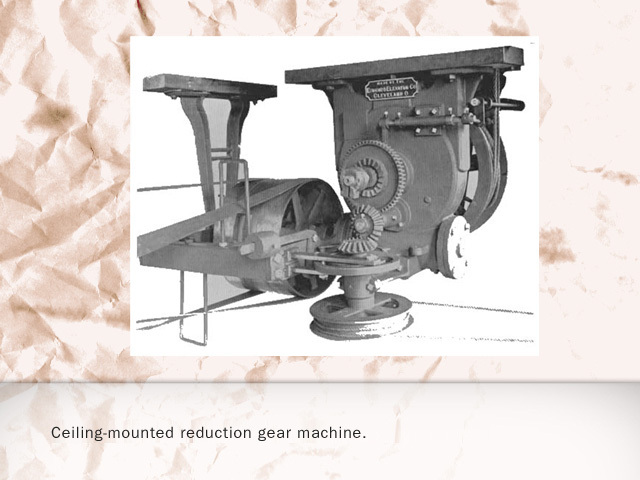 The gearing for lifting required up-and-down movement rather than the continuous motion of the production machines. 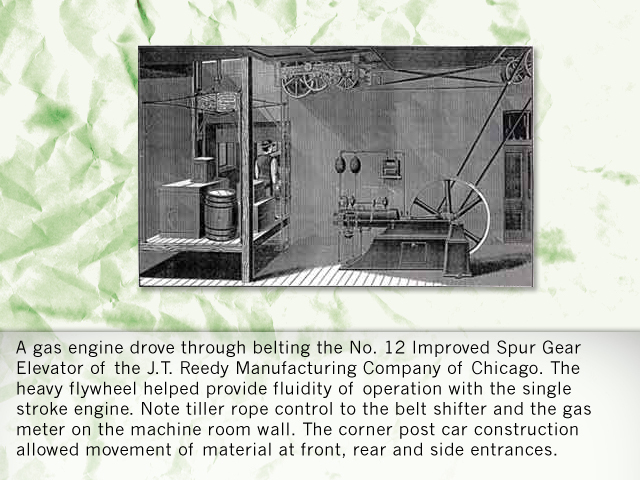 The all-important belting that bridged the power and the appliances also assisted in reversing the direction. 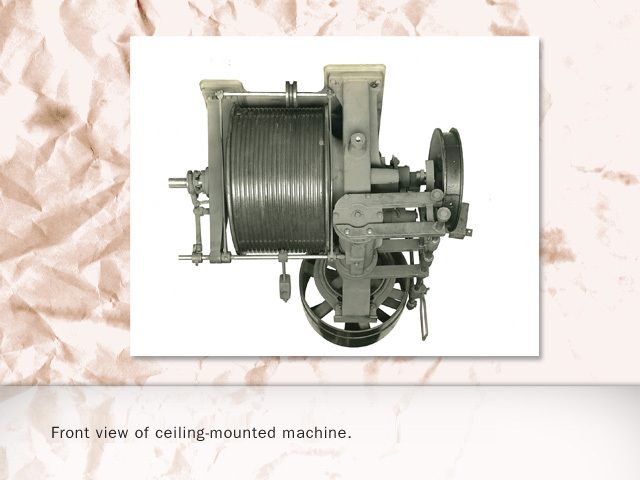 The belts became shorter and shorter until they, in the instance of lift machines, occupied a common bedplate. With the coming of hydraulic technology, new accessories were developed, including intensifiers, accumulators and counterbalancing, in an effort to efficiently drive and regulate cranes, presses, industrial lifts and elevators. In 1769, James Watt, a Scottish engineer, redesigned a Newcomen steam engine, giving it rotary motion with a sun-gear and making it a practical device for various commercial and industrial applications. 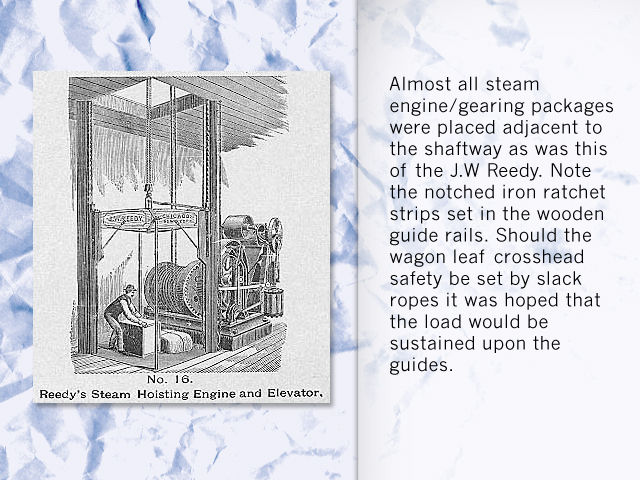 Although a number of mills still preferred to locate by rapid flowing streams, others could now be located in other advantageous areas by use of the steam engine. 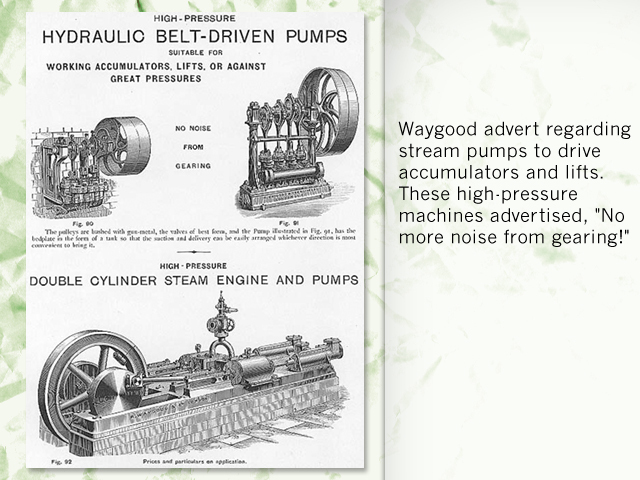 It is recorded that by 1800, 63 giant steam engines were powering textile mills in Birmingham, Leeds and Manchester. 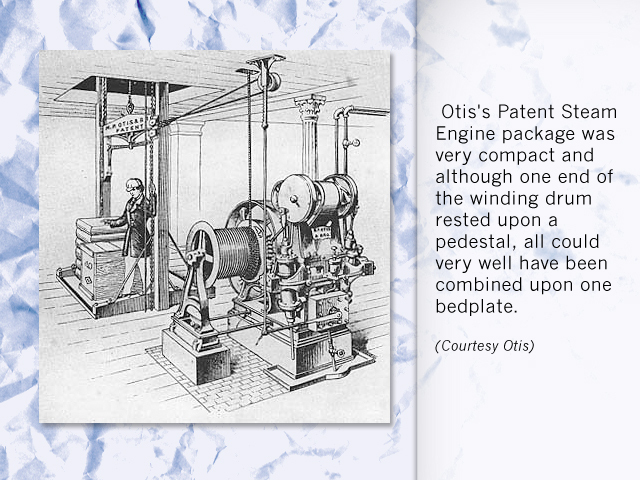 Some engines drove over 1,000 looms in a single factory. 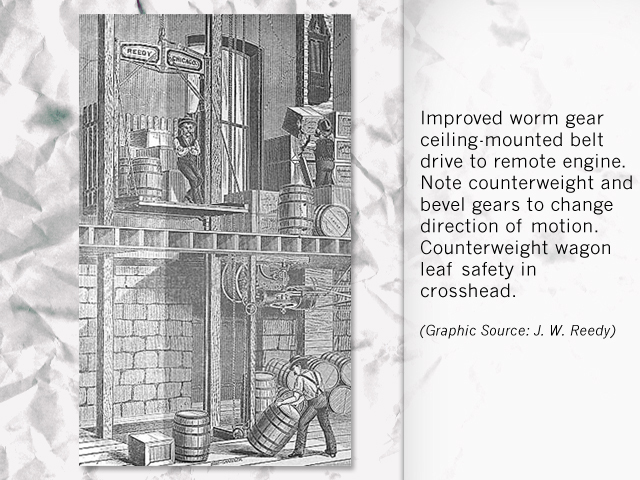 The economy of building multistory factories was discovered, and freight lifts were increasingly driven off line-shafts that ran along the ceilings of all levels. Whereas production machinery operated in one direction, lifts had to move both up and down. 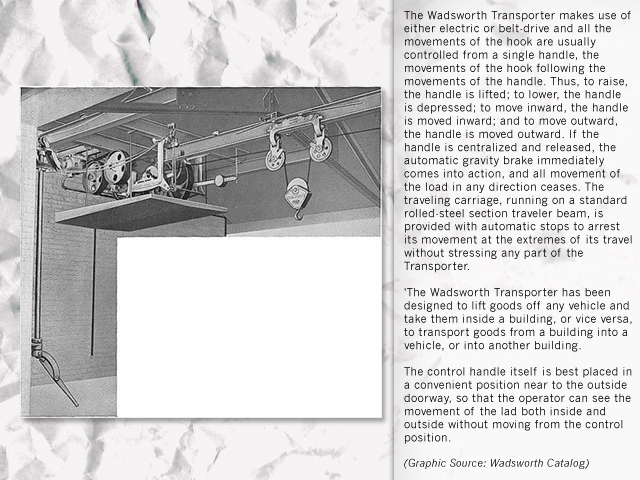 One of the two belts to the lift reduction gear was therefore twisted so that a manual shifter could alternate belts and reverse the direction of the lift. 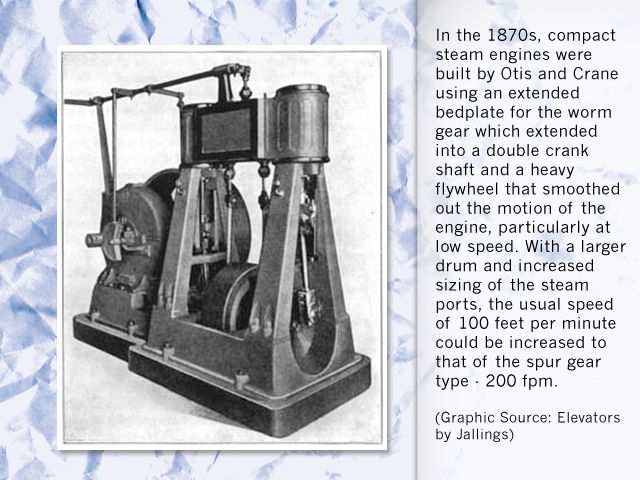 As early as 1759, hot air was proposed as a substitute for the steam-power piston machine, but the first working model was not built until 1807. 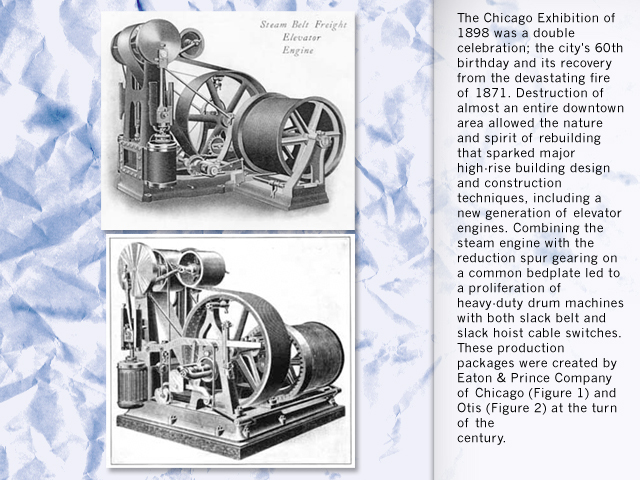 Robert Stirling in England and John Ericsson in America sold hot air machines to the public in the late 19th century. 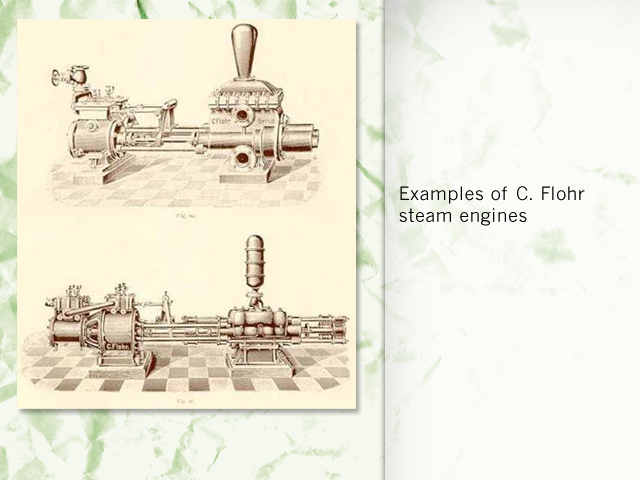 It was not until about 1900 that the hot air engine was supplanted with another variant upon the steam-piston machine -- internal combustion within the cylinder. 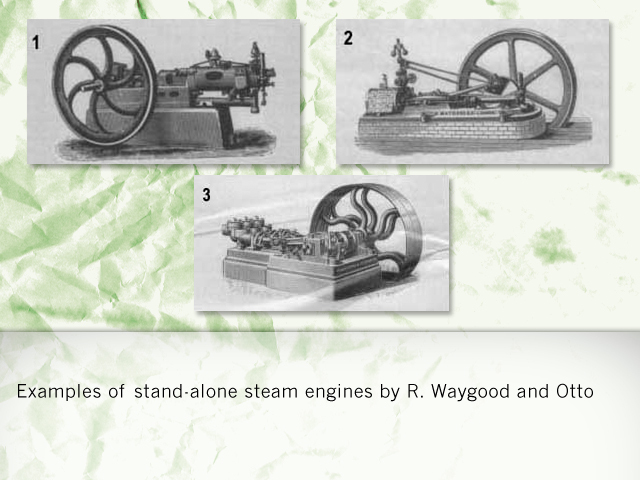 In 1791, an internal combustion engine was patented in England, running on vaporized turpentine. 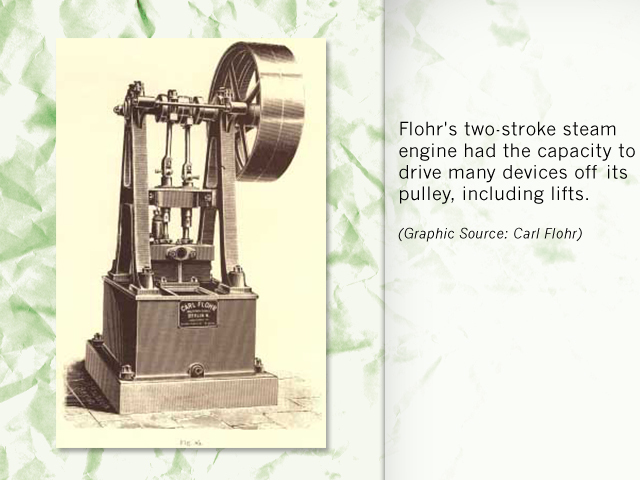 However, the first production model of an internal combustion engine fueled by illuminating gas was designed by Belgium inventor Jean Joseph Etienne Lenoir in 1860. A Frenchman, Alphonse Beau de Roches, dealt later with the means of refining Lenoir's machine the running costs of which had been excessive. 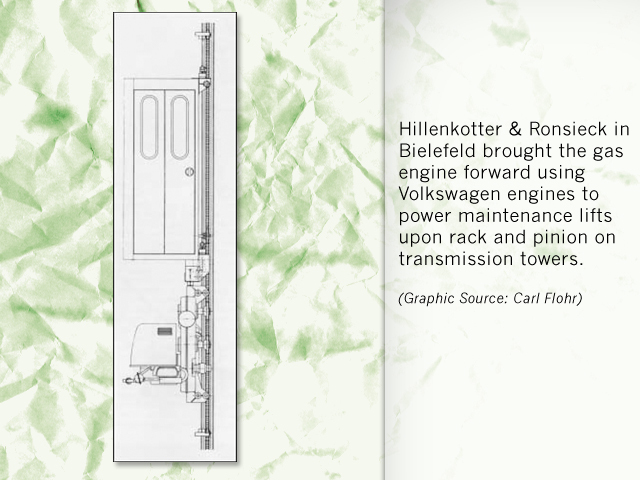 However, it was a self-educated German mechanic Nikolaus Otto who developed the four-stroke gas engine that compressed the fuel vapor in the cylinder before uniting it. 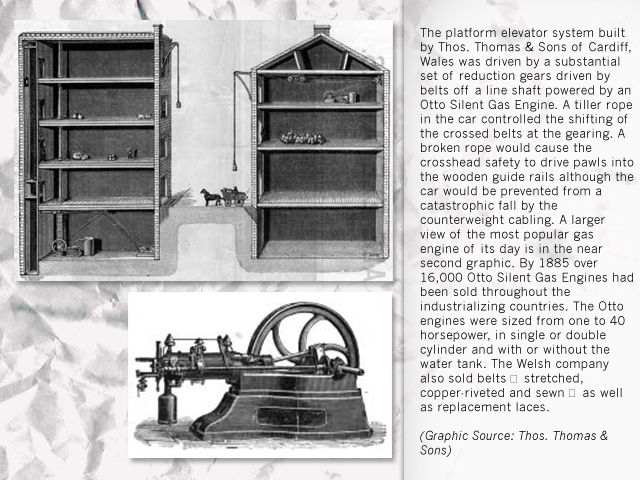 The gas engines were not only lighter and faster-starting than the steam type but used petroleum as a power source. Civil Engineers were the first within the engineering discipline, during the previous era of moving water, stone, dirt and brick. Within the Industrial Revolution, the Mechanical Engineer came into his own, just as the Electric and Electronics Engineers would emerge in another century, or two. 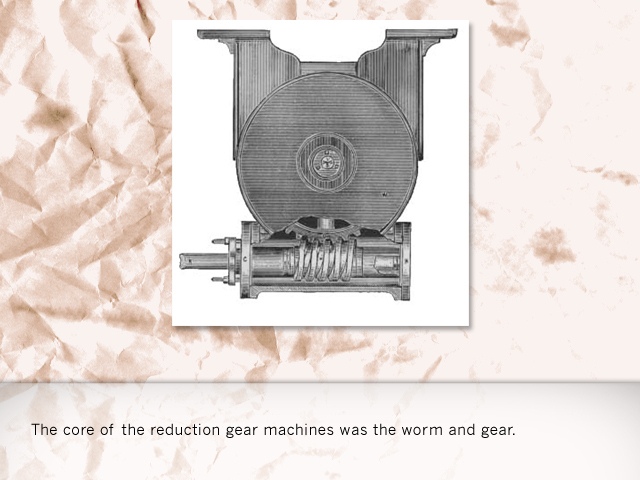 The development of gears, and combinations of gearing, had to become an exact science during a period when the Power Engineer was also assuming importance as a professional. It was a race, with the later striving to provide more power, the users demanding more power for production and the Mechanical Engineer in the middle taming the power with heavier, safer and more sophisticated machines. The new metals, forging and castings were allies in the battle! 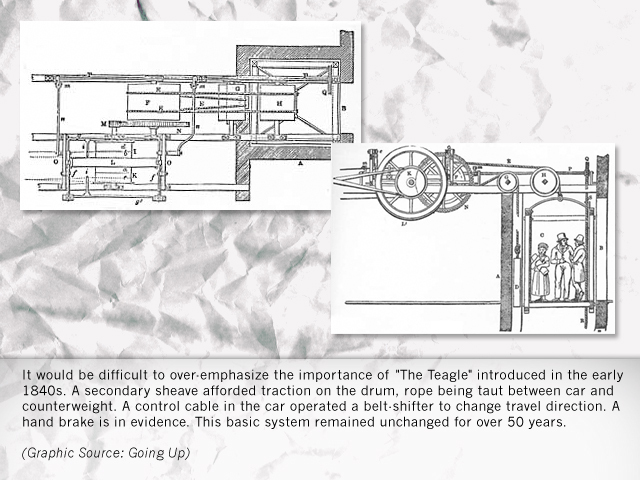 With the direct connection of lifting machines to power source still a distant dream, the simple, lowly leather belt became as important a link in the overall system as the metal ropes supporting the car. 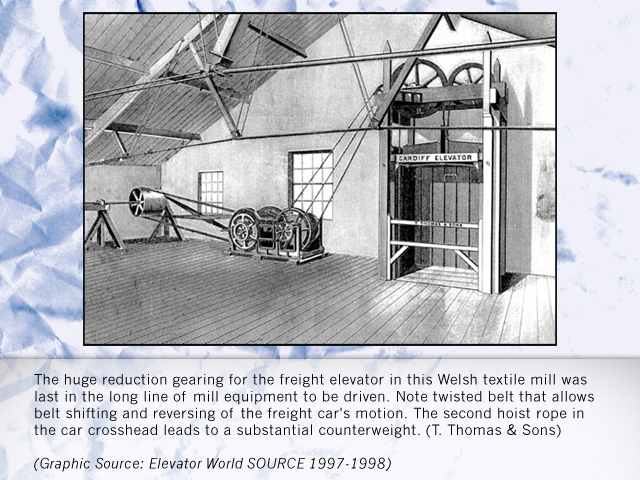 Initially, the lift was located far from the main source of steam power in the mill, merely linked, via belt, from the long drive shaft as "one of the machines." 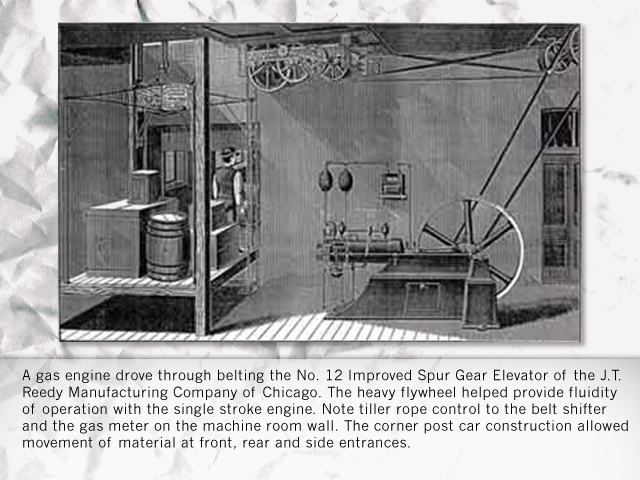 As the elevator assumed more importance, the belt between the power source and the reduction drive became shorter and shorter until the individual power source was within eyeshot, then within the same machine room, then next to the bedplate, and finally -- on a common bedplate. 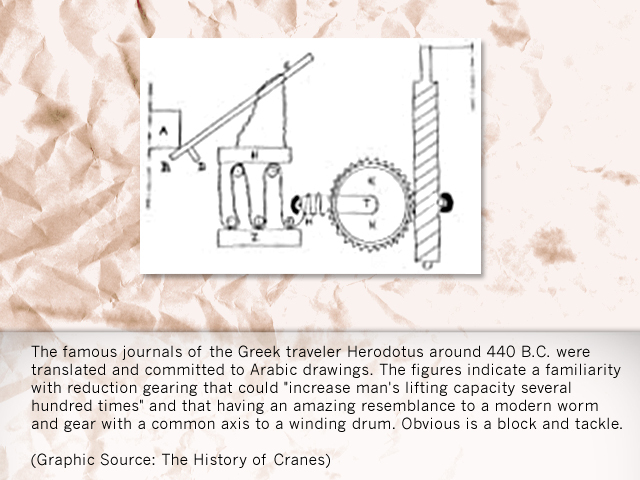 Recognition has always been properly given to those who invented the engines providing the power to drive machines; not so often to those who provided the linkage. 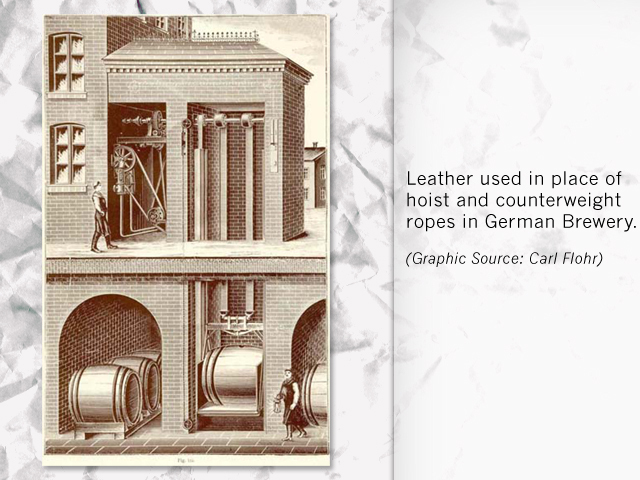 "Wire rope" will be given its recognition elsewhere in the museum, but little is known about the evolution of leather belting that for so many decades provided the link between the power source and the production machinery. 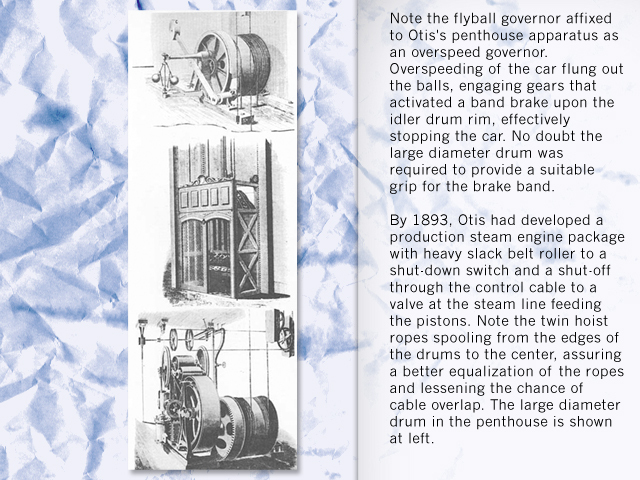 Numerous unknown tanners and fasteners made minor improvements through the years that brought forth durable belting, the vital means of transmission when direct connection was only a dream of those seeking to improve the speed and safety of lifting. 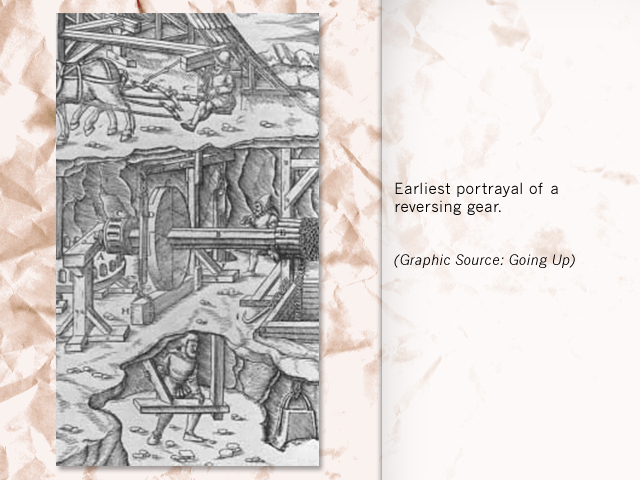 Lifts were appendages to production machinery, on the end of the line-shaft. 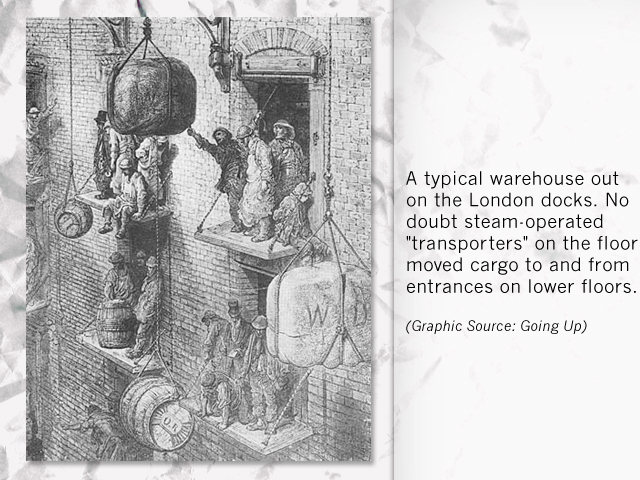 Life was cheap in the early days of the Industrial Revolution: moving goods -- trade -- was important! 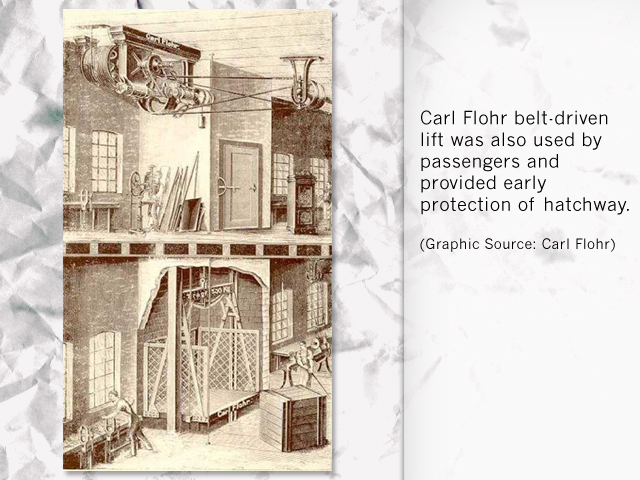 It was only later that belts also aided in moving passengers and a modicum of safety was provided. 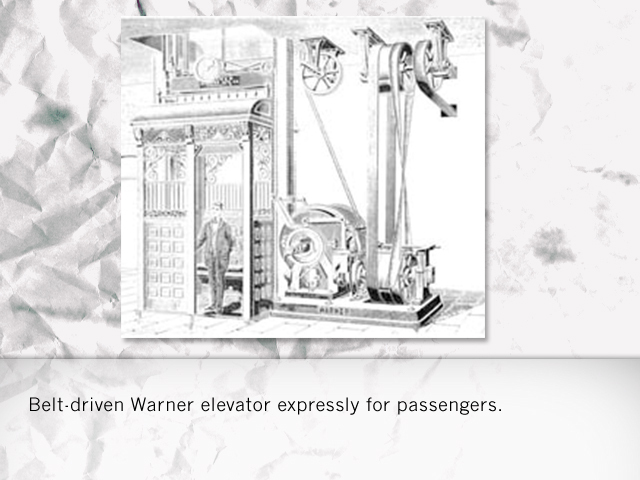 The elevator slowly became useful as a means of moving people. 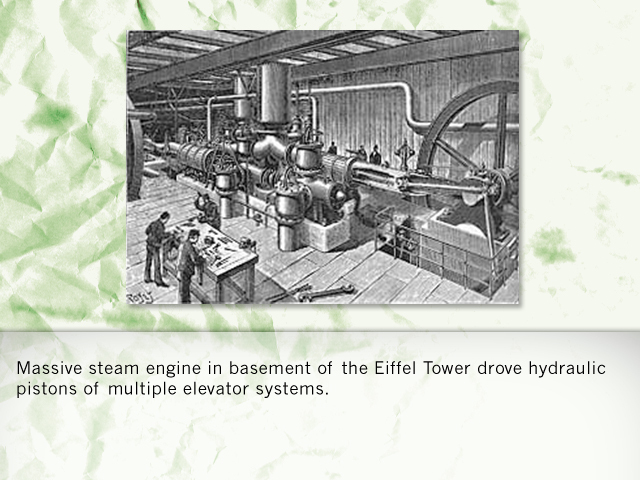 The steam and gas engines moved closer to the point where a passenger elevator had its own power plant. 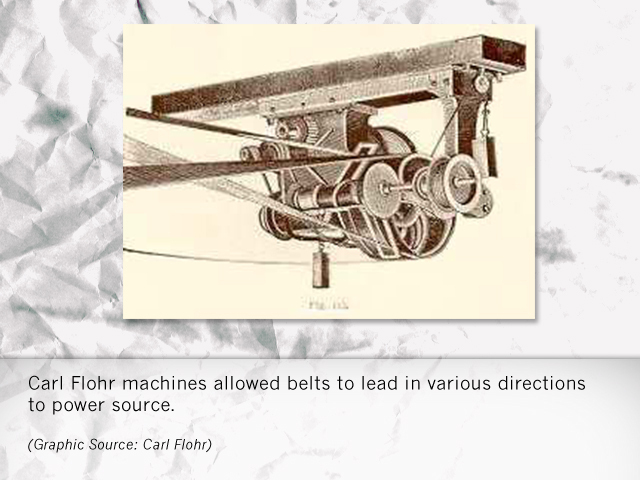 The belts also became shorter, moving ever-closer to the reduction gearing until engineers began to consider making it a part of the machine bedplate. 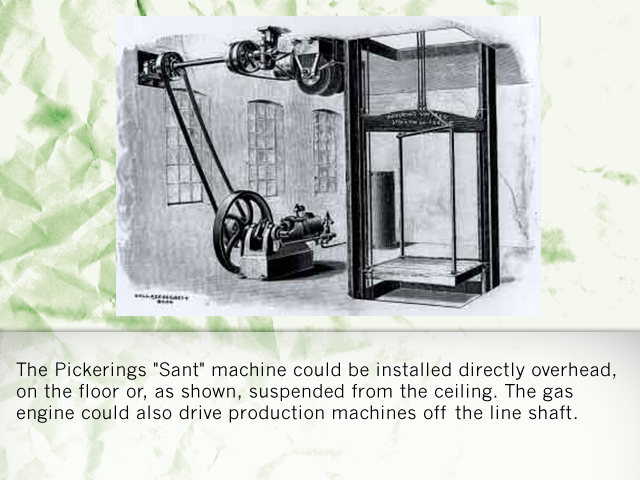 The idea of a "package" elevator machine was beginning to emerge! 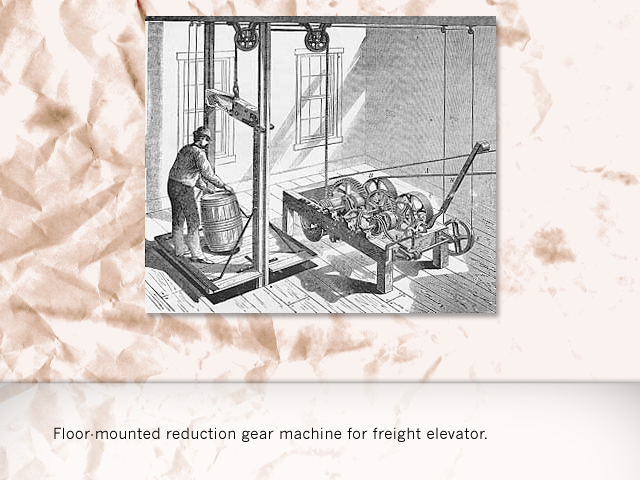 In the mid-1800s, the elevator machine was well on its way to becoming a package! Early in the Steam Power Age, lifts(s) had been the "tail on the dog", at the gar end of line shafts that drove hundreds of mill machines. 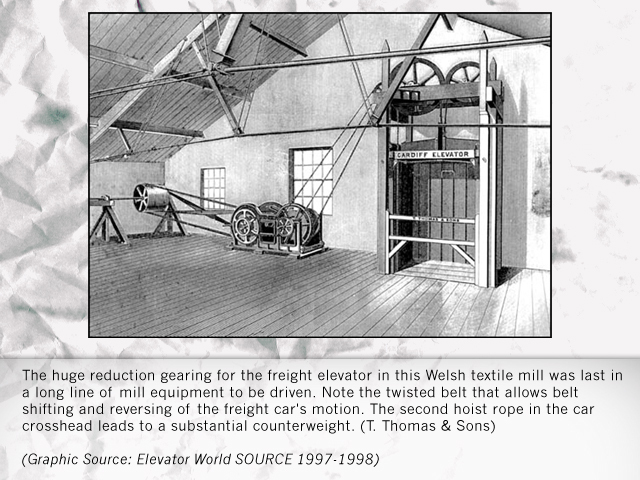 Gradually, as we have seen, elevators became more important within commercial and private establishments, lifting both freight and passengers and warranting individual steam power plants, or the major use of one. 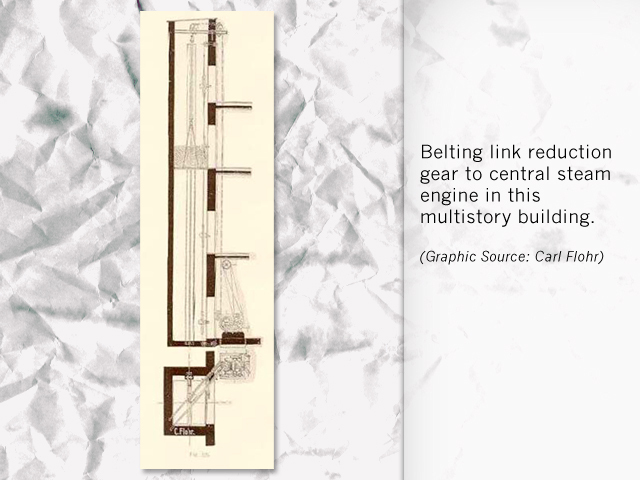 The connecting belts grew ever shorter until steam engines came within sight of the reduction gearing; then next to it within the same machine room. Engineers had the obvious thought; why not mount as much equipment as possible on one bedplate, making the drive machine more utilitarian, economical and space efficient for the manufacturers and owners, as well as more practical for the on-site maintenance man. 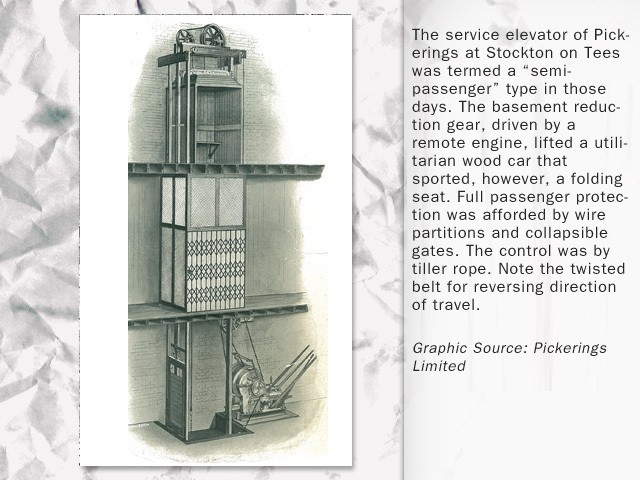 In this era, scheduled maintenance by an elevator company was not even a gleam in any manufacturer's eye! 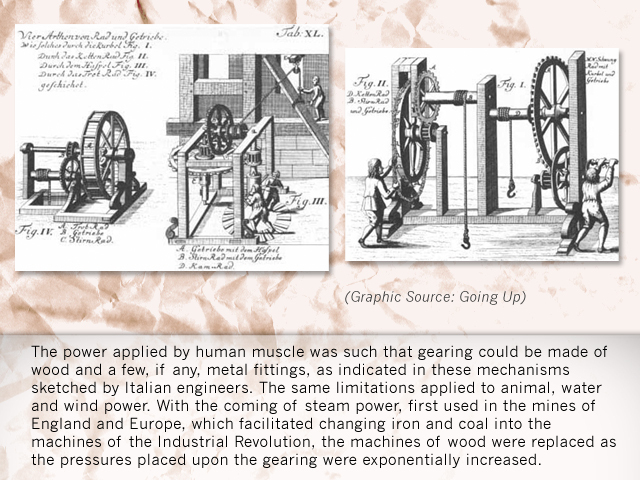 An important era emerged in which the unification of the power and drive machine took place accompanied by the gradual additional of a few more control and safety devices.